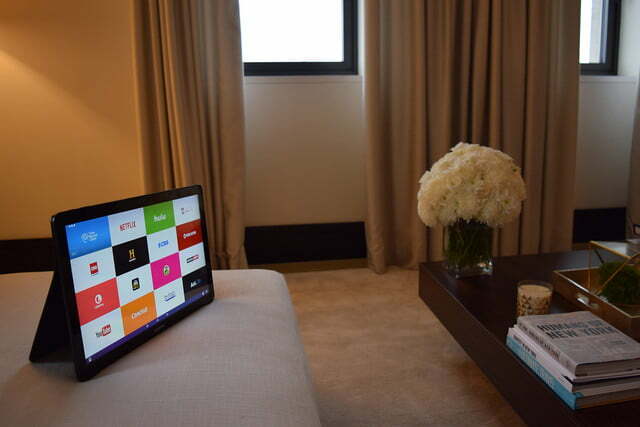 People already uses tablets as “a TV for every room in the house,” so Samsung built one worth watching. Samsung’s not afraid of trying insane new ideas before everyone else. Look at what happened with the smartwatch: Samsung popped out six of them and didn’t give a damn when people scoffed and questioned its sanity. Now, Samsung is ready to defy logic again with a new product category: the TV tablet. 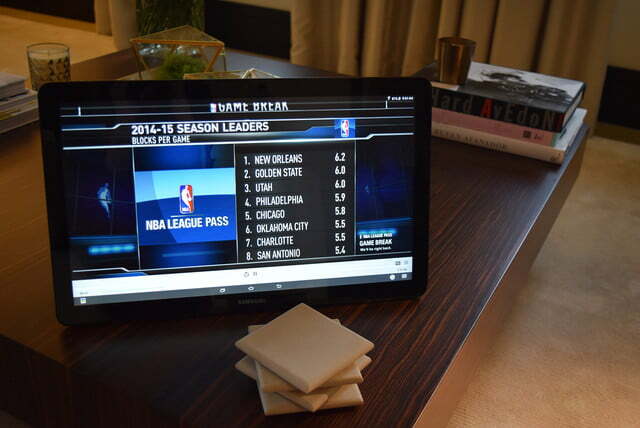 Samsung’s Galaxy View is less a tablet and more a portable, touchable TV that you can carry with you around the house. 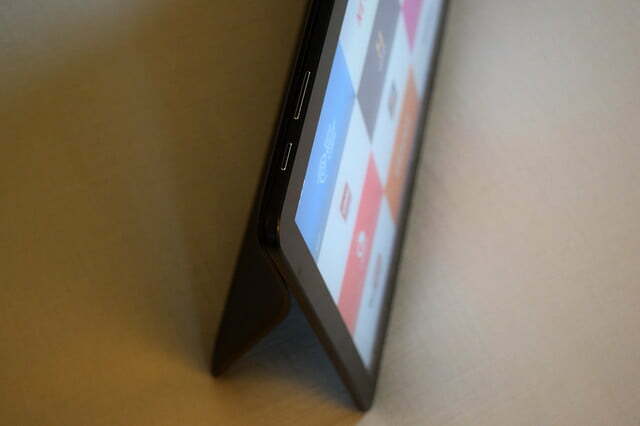 Sure, it weighs 5.8 pounds and has a weird built-in stand that never lays flat, but it’s actually kind of genius. We took it for a spin and spoke with Samsung’s designers to figure out why on Earth you’d ever want to buy such a big tablet. Or such a small TV. 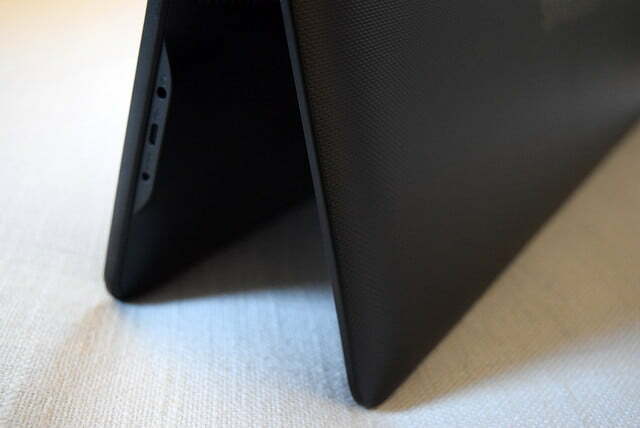 Tablets promise portability, productivity, and picture quality. But do you really take it with you? 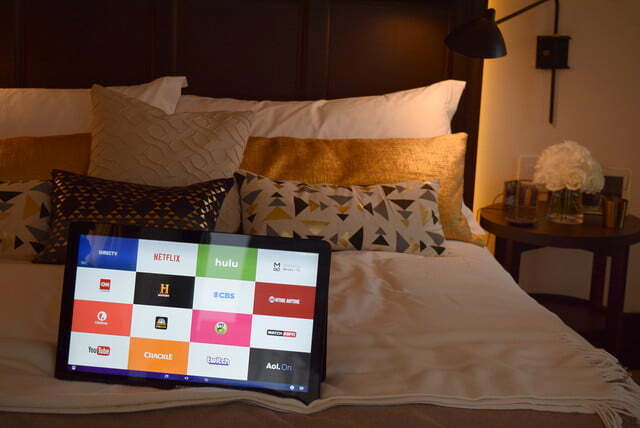 If you’re like most people, you probably leave your tablet at home and watch movies and TV on it until it’s time to go to bed. 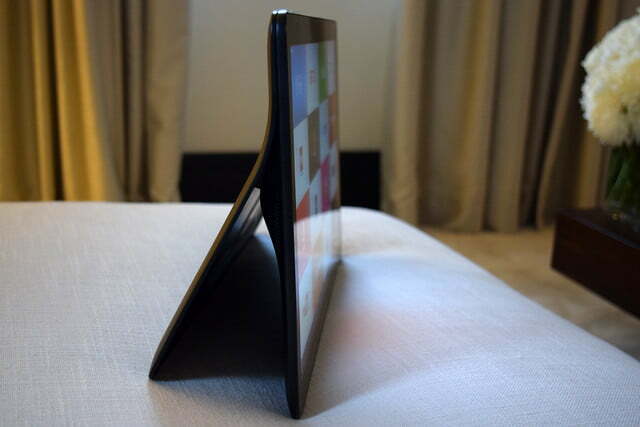 But that 8- or 10-inch screen can start to look awfully small. 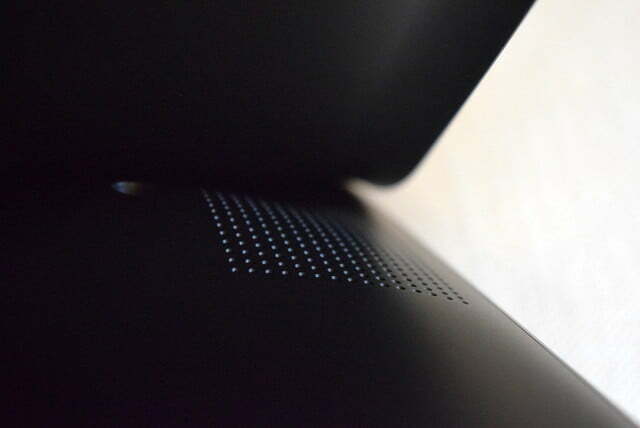 That’s where Samsung’s Galaxy View comes in. 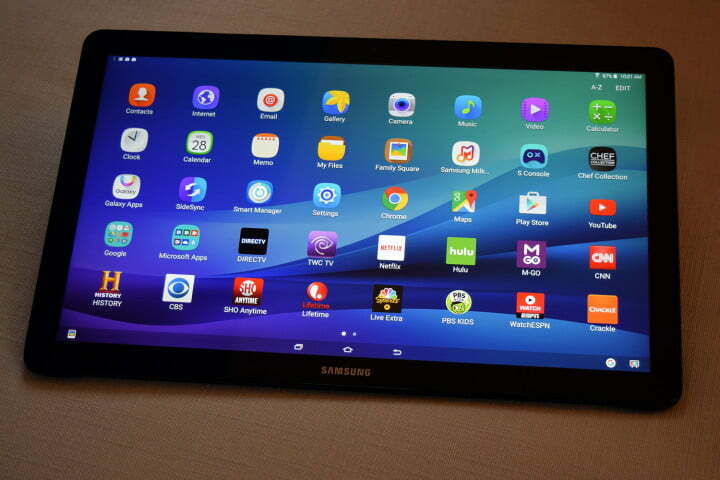 It’s twice the size of your average big tablet, and almost triple the size of most small ones. 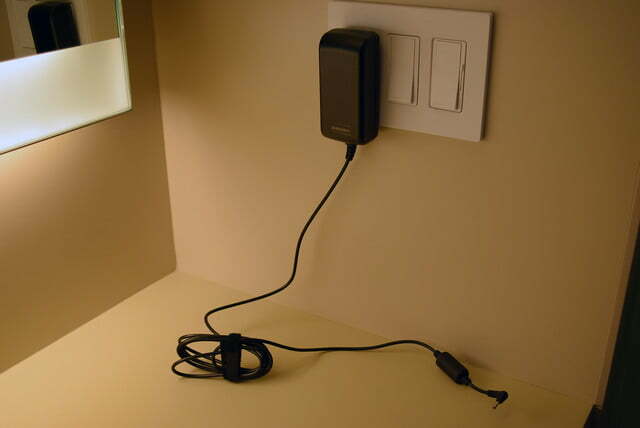 It has a built in kickstand that has two modes and never rests flat against the device. 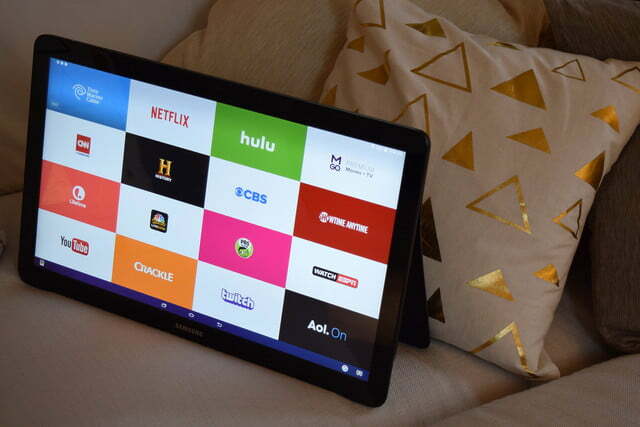 This is not a tablet that you’ll want to take on the plane or train, but it sure is one that you’ll want to bring camping or to the lake house for a bit of entertainment. If you’re not the outdoorsy type, or rich enough to have a lake house, the Galaxy View will also do just fine lounging in different rooms of your house or apartment, when you don’t want to be tethered to the main TV. 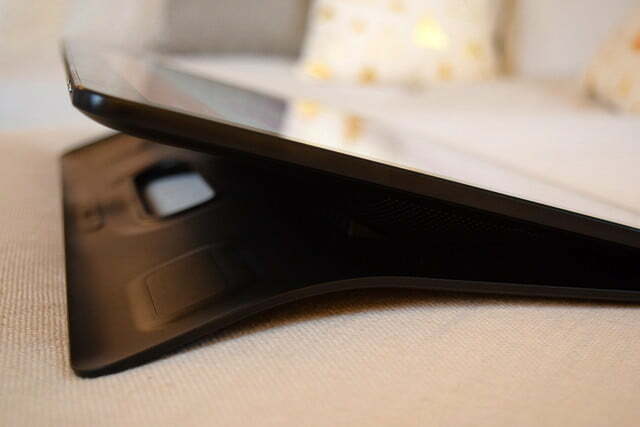 The kickstand has its own handle, so you can awkwardly carry it from room to room in your house. I say awkwardly, because to grip the handle, you have to put the stand in lap mode, and the handle weirdly sticks out at an angle. 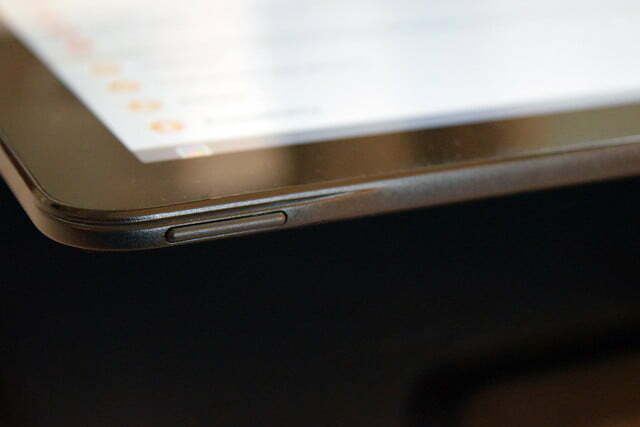 The first time you hold it this way, you’ll likely be terrified that the stand is going to snap off, because you’re not holding the heavy part of the tablet. Samsung assured us that this thing is very sturdy, and they’ve knocked it around a lot to make sure that it won’t break. For a device you’re supposed to tote around, that’s crucial. Every suburban dad has the same fantasy of having a TV in every room so that he never misses a second of the game. The Galaxy View makes dad’s fantasy a reality. 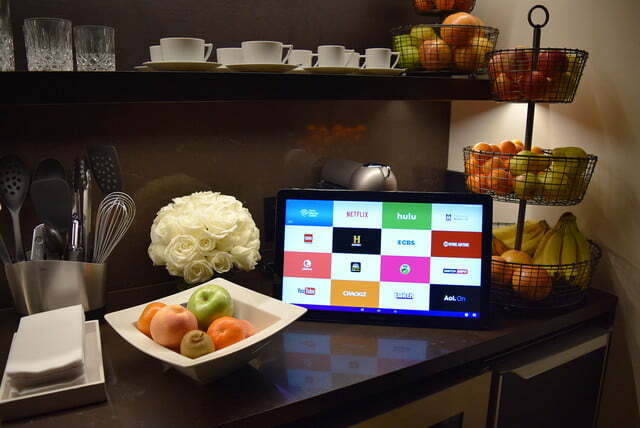 Samsung walked us through a living room, kitchen, bathroom, bedroom, and dining room to illustrate all the places you can go with the Galaxy View. 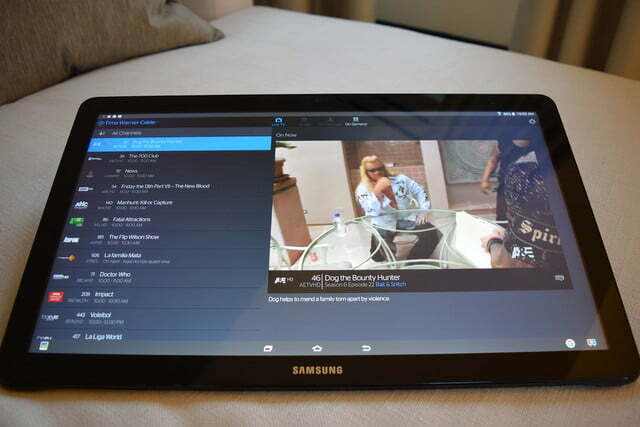 Samsung designed the Galaxy View as a streaming device, so it’s really a TV first and a tablet second. The View’s 18.4-inch screen is optimized for video with a 16:9 aspect ratio and full HD resolution of 1,920 x 1,080 pixels. Most video that you stream or download is still in 1080p, and likely will be for a while, so Samsung opted to save battery life and cut costs with the 1080p screen. For all you pixel purists out there, it looks just sharp and bright, so you shouldn’t have too many problems with it – unless you’re already spoiled with 4K. 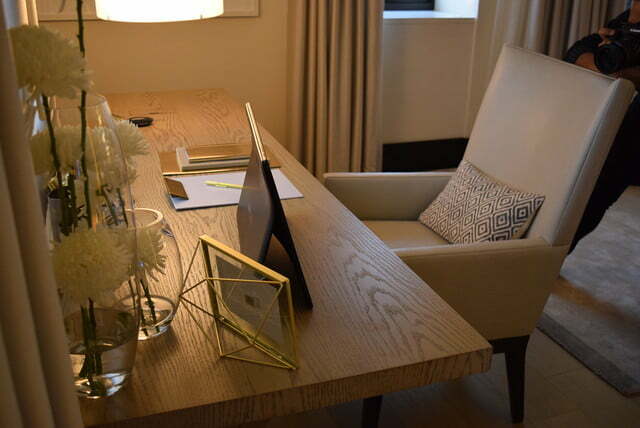 You can take your tablet with you, but the question is, do you? We watched live TV news casts from CNN, a PBS kids’ spot, and a number of movie trailers on the View, and they all looked really great. 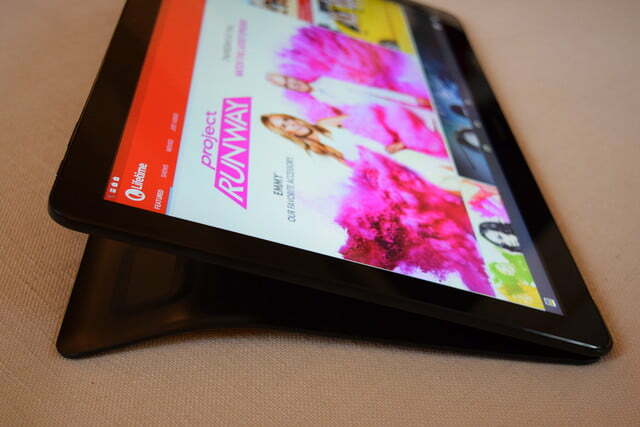 The stand sits at a smart viewing angle when set upon a tabletop. You don’t get too much glare, either. 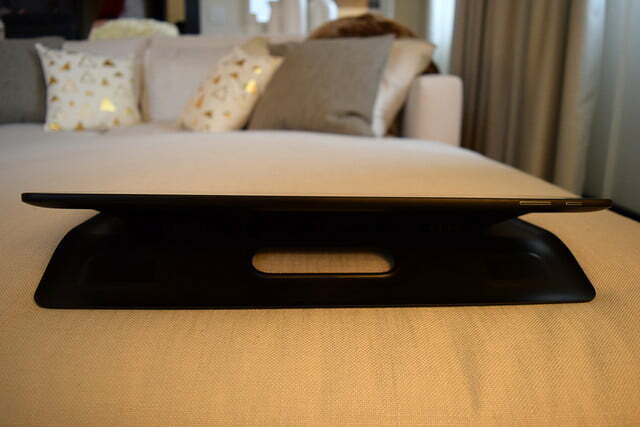 A second setting drops the View lower for use in your lap, or when you’re lying in bed watching a show. This angle works, though you do get a bit of glare if your lights are on overhead. We imagine this mode will be most useful in bed, but you may need a pillow to get the angle just right. This will require some serious testing, though. 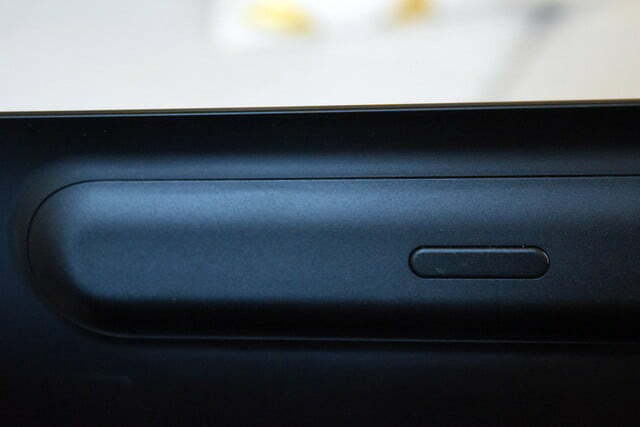 The View packs either 32GB or 64GB of storage, but a MicroSD card can expand it up to 128GB. That may not sound like much, and it isn’t, but Samsung is betting that most users will stream their movies and TV shows – not download them. 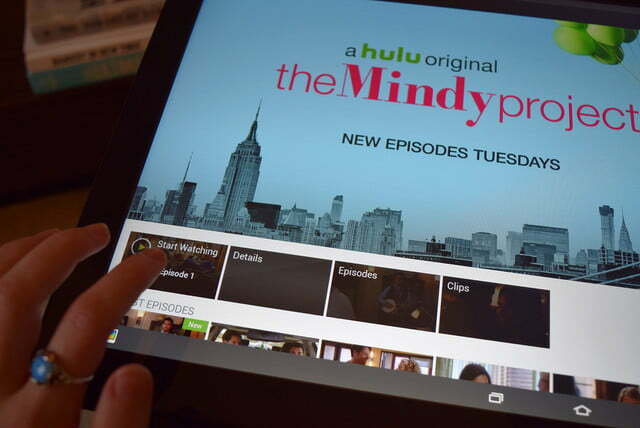 The home screen of the View is populated with the most popular streaming apps, so that you can dive right into your favorite shows without fumbling around for an app. 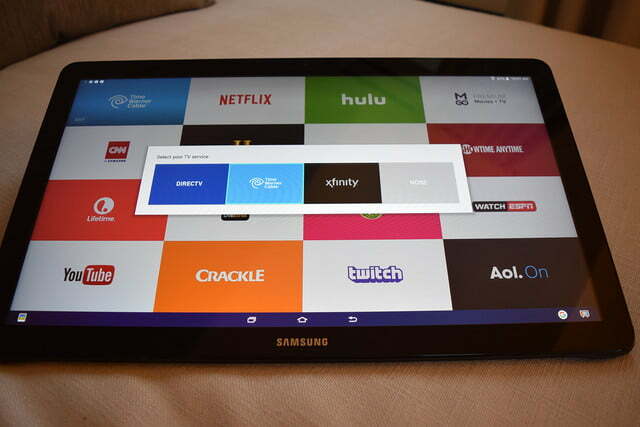 Samsung is also working closely with cable TV providers and streaming companies to offer deals to customers. 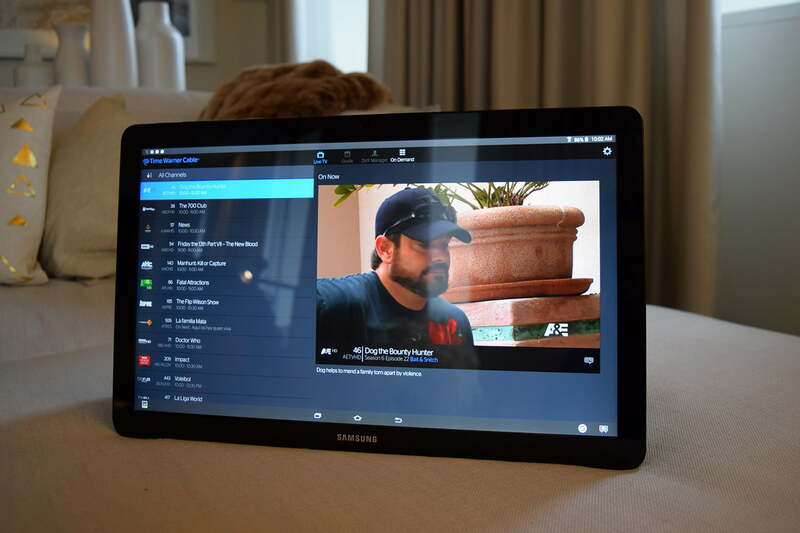 So if you use Time Warner Cable, Dish, or some other cable provider, you can link the View up with that and get live TV on your tablet when you’re away from your TV. 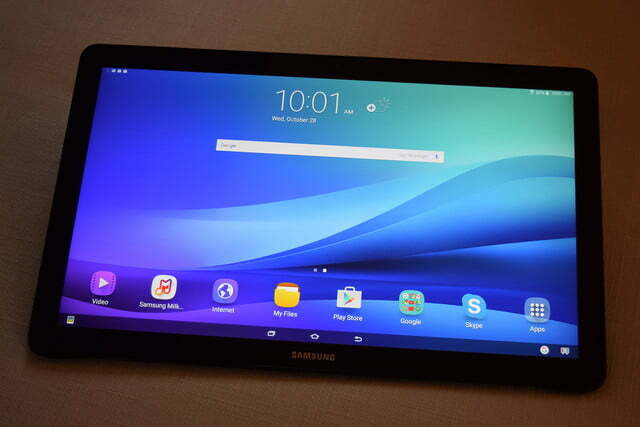 The tablet’s two 4-Watt speakers seemed to offer really robust sound for a tablet, and Samsung says they’re angled outwards to offer a 360-degree sound experience, so you can squeeze a few friends around it. 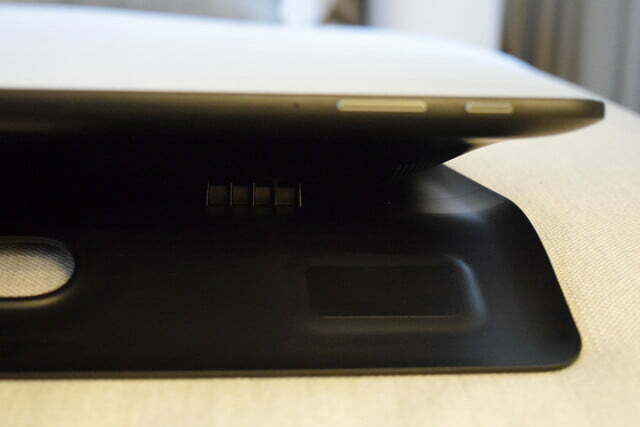 Samsung says the 5,700mAh batteries bulging from the middle of the tablet should keep it running for eight hours of video playback, so you could theoretically watch the entire Back to the Future trilogy in one setting without running out of juice. If you’re not sold on the idea of a tablet TV, you can also use the View as a productivity device. 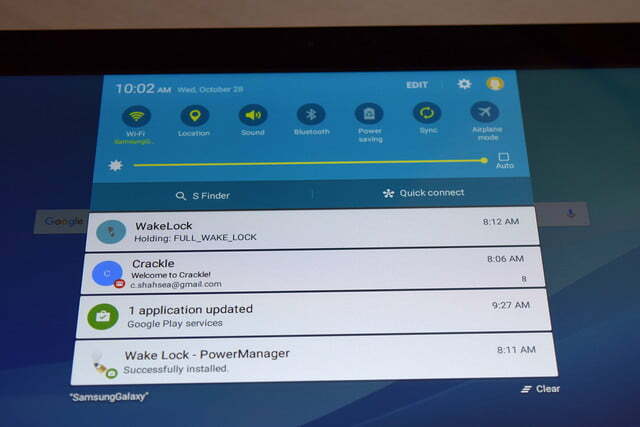 Since the View runs Android 5.1 Lollipop, you can use any Android app on it. That means you have access to Google’s suite of Docs, Sheets, and Slides apps, as well as drawing apps, games, and more. Split screen view works, too, so if you want to check Twitter while you watch TV, you can do so without losing too much screen real estate. 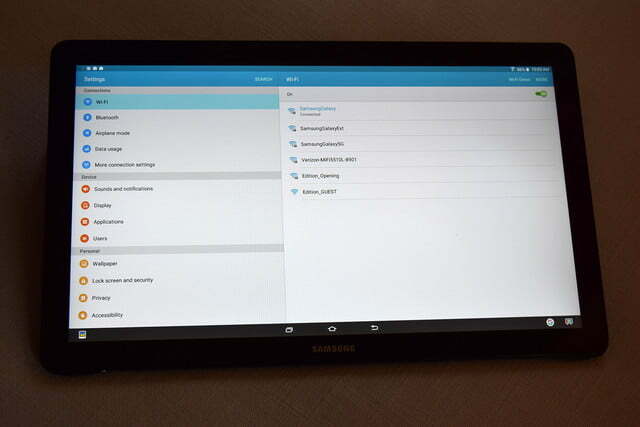 In fact, we’d argue that split screen view is best on a tablet of this gigantic size. 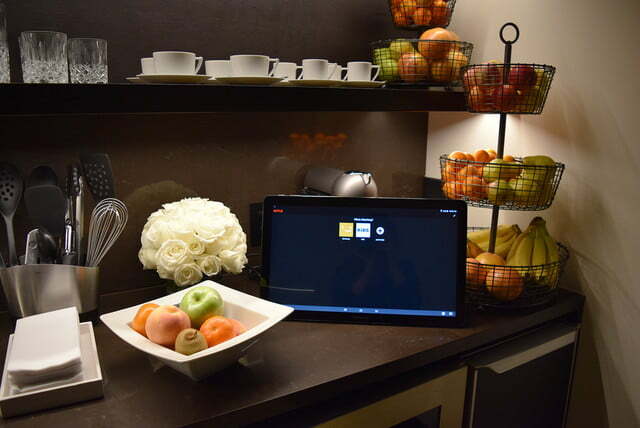 As with any odd device, there are downsides to Samsung’s Galaxy View. Obviously, it’s too big to realistically carry with you. 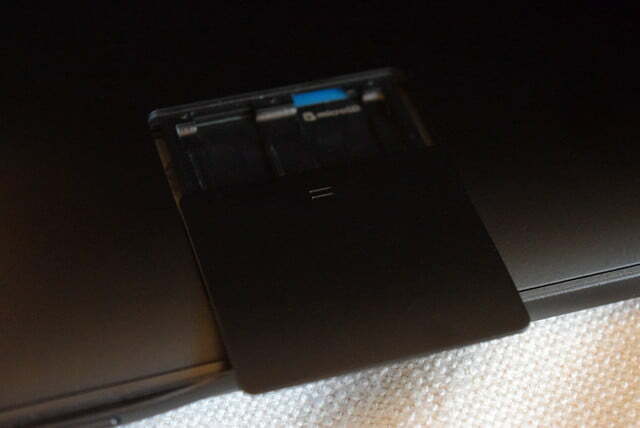 Also, since the stand never lays flat, it’s really awkward to put in your bag. You either have to take up an entire bag with the tablet alone, or throw it in a huge bag and pray to God your other gear doesn’t break the stand. 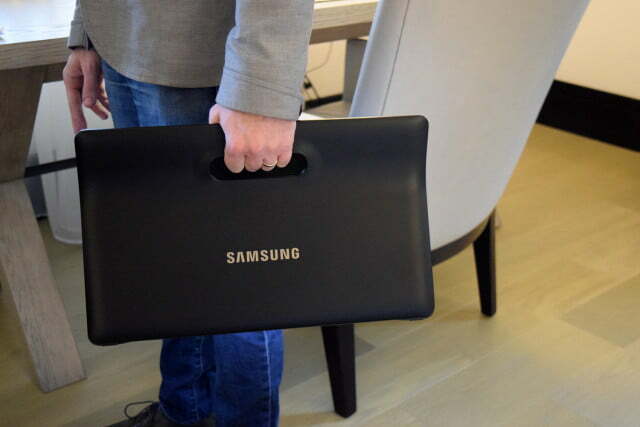 Samsung’s even making a special bag for this thing – that’s how weirdly shaped it is. 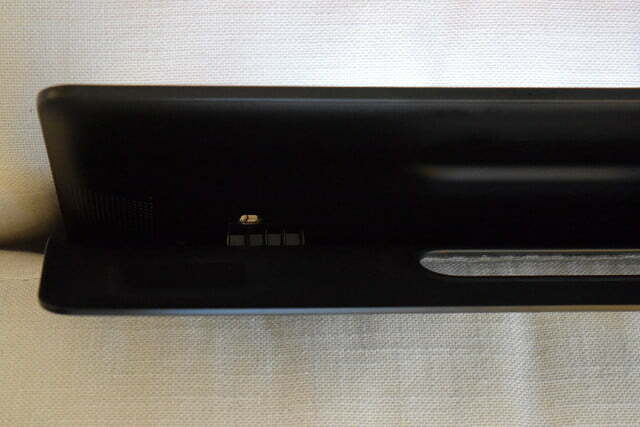 Lenovo’s solution is much more practical: a cylindrical battery base and built-in stand that can angle in any direction as well as lie flat. 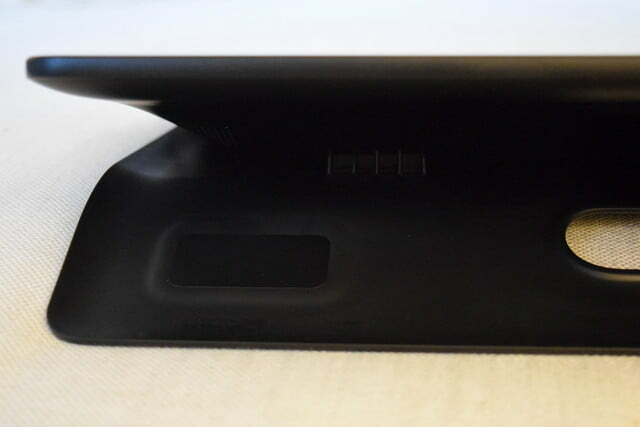 However, the speakers and battery on the View are much better because they are bigger, and their large size is possible thanks to the odd design. The View is also quite heavy at almost 6 pounds. Kids will have a rough time carrying it around the house – especially upstairs. Even I found it heavy – I’m still not sure if that will make it uncomfortable when I’m watching a two-hour movie in bed. 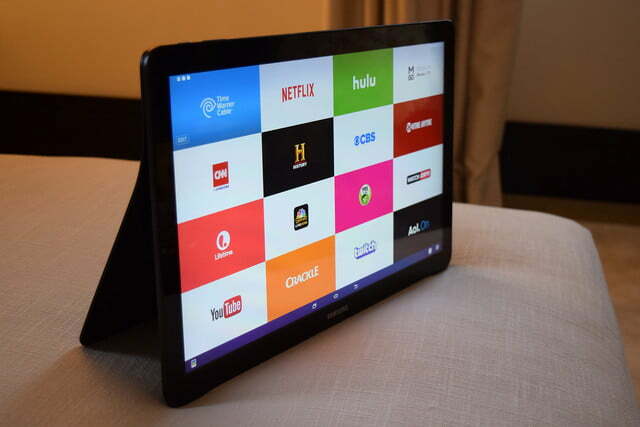 It’s also quite expensive at $600, and there is the question of whether you need a tablet this big if you have a TV or just live in a small apartment. 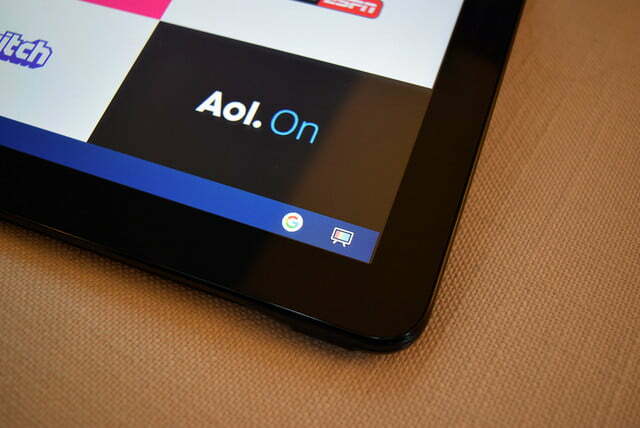 Those who already own a 10-inch tablet may also hesitate to buy yet another slate. If you do buy one, you’ll have the dubious honor of owning a tablet that looks suspiciously like one of the “big area touchscreens” in Fox’s News’ studio. 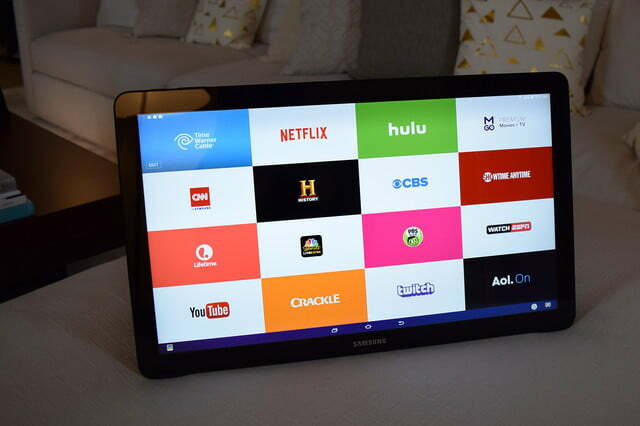 Samsung’s Galaxy View certainly isn’t for everybody, but it does present an opportunity for tablets to make a comeback. 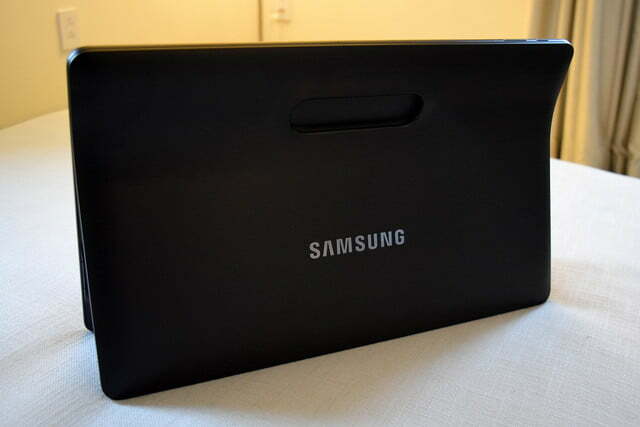 Although tablets that break the 10-inch size barrier haven’t traditionally sold well, the Galaxy View is different. 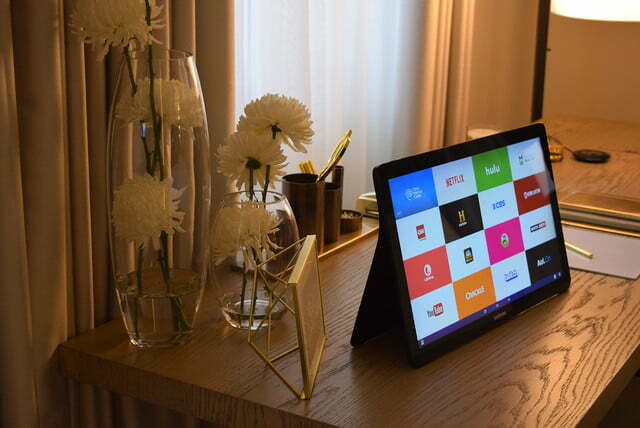 It’s not pretending to be portable enough for a plane trip or bus ride – it’s a giant, in-your-face tablet that’s meant to stay in your home. 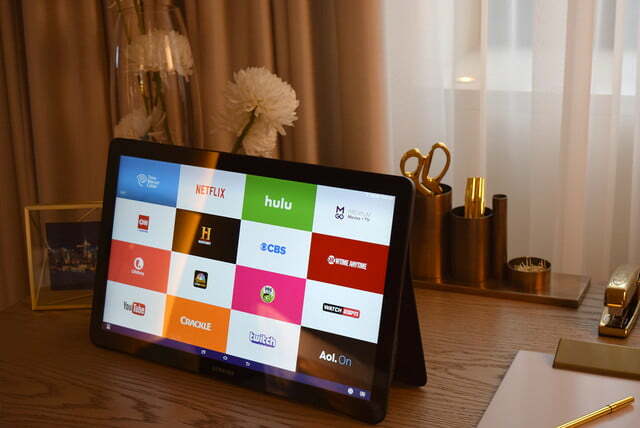 It’s still portable enough to move from room to room, but it’s big enough that you almost feel as though you’re watching your favorite shows on a TV. 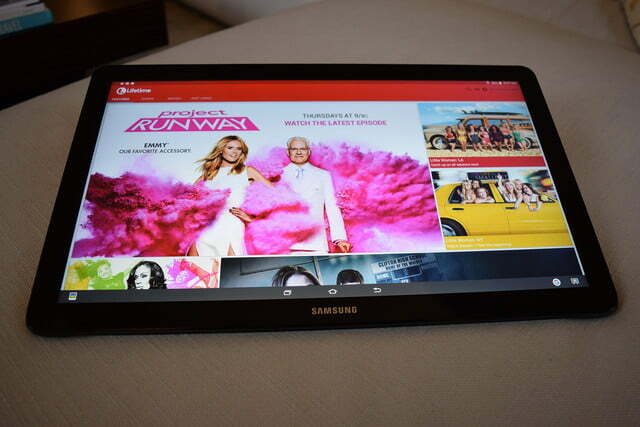 Since most people use their tablets for watching TV and video anyway, it makes sense to make the tablet what it is: an entertainment device. 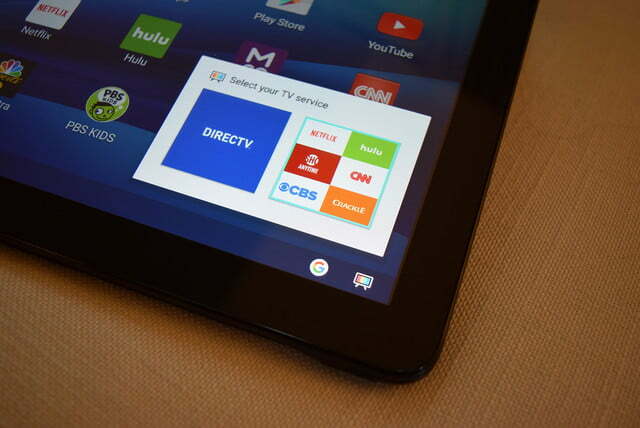 Price is issue – a tablet this big doesn’t come cheap – but it could be a good device for people who don’t own a TV or simply want a small one they can move around the house. We’ll need to spend some time with the Galaxy View to see if it’s actually practical, and more importantly, how much fun it is to use.